The story of the Speedmaster began in 1957, when OMEGA’s Claude Baillod designed the watch for his manager, Head of Creation Pierre Moinat. The first few models (CK2915 and CK2998) had a symmetrical shape and were replaced by the a-symmetrical case as we happen to know it now, in 1963. When the Speedmaster was chosen by NASA to become part of the astronaut’s equipment, OMEGA added the wording ‘Professional’ on the dial in 1965. 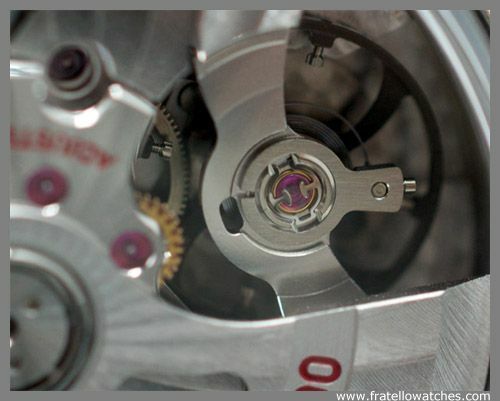 The rest is history and has been discussed and documented by many, including here at Fratellowatches. 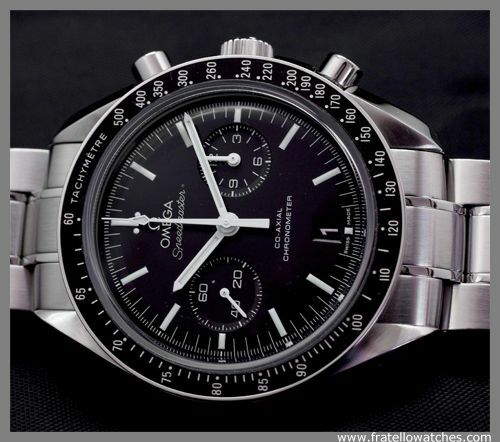 Besides the Moonwatch, OMEGA developed and produced a number of Speedmaster watches that were not part of the Professional series. We would say that the Speedmaster ‘Reduced’ is probably the most popular non-Moonwatch Speedmaster and that the Speedmaster Automatic ‘Holy Grail’ the most sought-after model. For now at least. This article is all about the new OMEGA Speedmaster Co-Axial Chronograph ref. 311.30.44.51.01.002 with the in-house caliber 9300 movement. 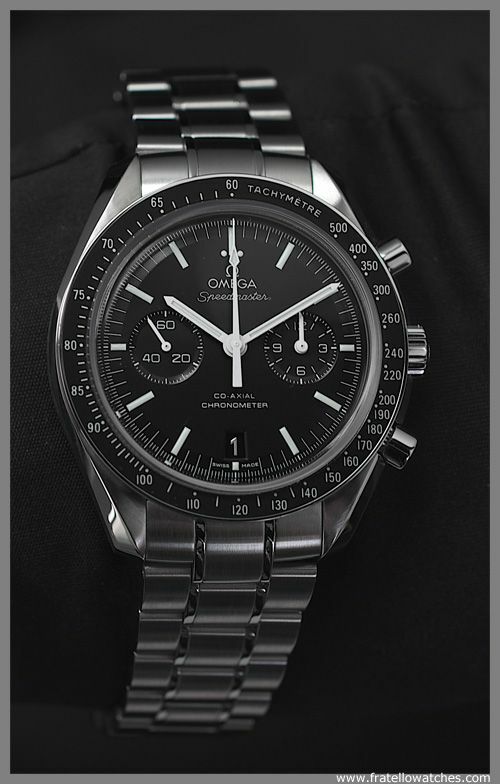 This two register Speedmaster chronograph was introduced during BaselWorld 2011 but has been a bit in the shadow of the (also) newly introduced Seamaster Planet Ocean line-up. The new Speedmaster non-professional does not get the attention it deserves to be honest. 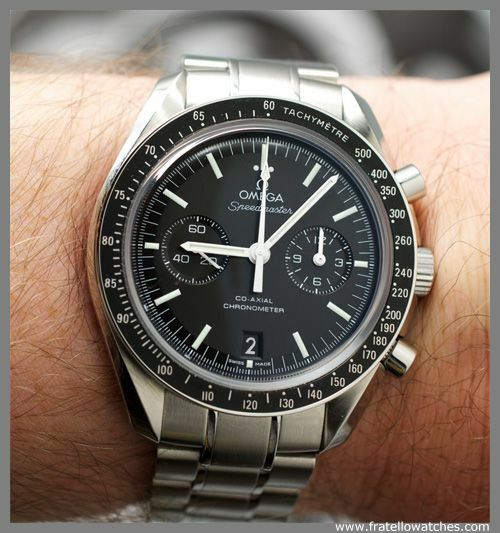 It is not a Speedmaster Professional, so we won’t do a comparison. But let us say this: The Speedmaster Co-Axial Chronograph is meant for those who love the NASA heritage, the Speedmaster-cult status and the design of the ‘original’ but need a watch with a date, an automatic mechanical movement and – perhaps – an in-house movement. OMEGA was able to send us a Speedmaster Co-Axial Chronograph for review purposes and in short: we had a hard time giving it back. The size of 44.25mm is more modest on the wrist than it seems by specification, so don’t let this scare you. The dial of the watch is simply mesmerizing and very thought-through with only 2 sub registers. OMEGA combined the 12 hour recorder with the minute recorder in one sub register, which is quite easy to read when using the chronograph to time certain things (we timed a few long trips with this watch). 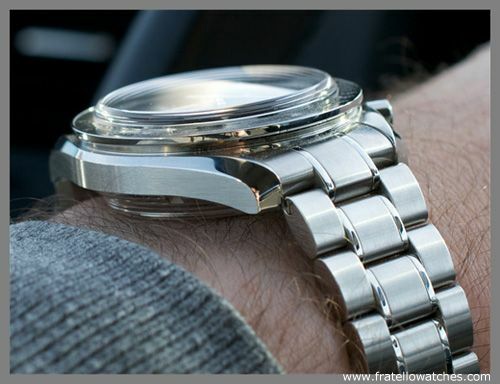 We’ve heard people commenting on the watch that there is too much distance between the sub registers, however, our logical explanation would be that when the sub registers would be more close to the center pinion, the short end of the chronograph second hand could possibly block the view of one of the sub registers. Our other guess is that people need to adjust to this lay-out and can’t stop comparing the Speedmaster Professional ‘Moonwatch’ with this Speedmaster Co-Axial Chronograph. Before we get to the previously mentioned in-house chronograph caliber 9300 (also discussed here in detail), let’s have a look at the new Speedmaster bracelet. A comfortable Oyster-style bracelet with ‘Speedmaster’ engraving in the clasp. The clasp is identical to those on previous Speedmaster models, using two pushers to open and a simple but firm ‘click’ to close. The links of the bracelet are connected to eachother using screws instead of pins. Well, that’s not entirely true. There is a pin inside, that is being locked by two small screws on each side. We expressed our worry about losing one of the two screws and thus losing the pin inside. Head of Development of OMEGA ensured us that this system has been tried and tested and that you shouldn’t fear. During our period of testing this Speedmaster Co-Axial Chronograph, no issues occurred with the bracelet. 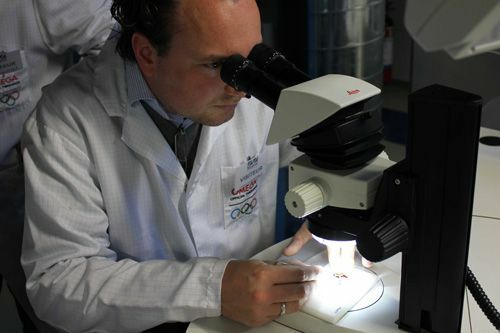 During the test period of this watch, we’ve been invited by OMEGA to visit their revamped museum in Bienne (reported here, lots of pictures), have a lunch with CEO Stephen Urquhart and visit the production facilities of the Co-Axial escapement and their new in-house movements. 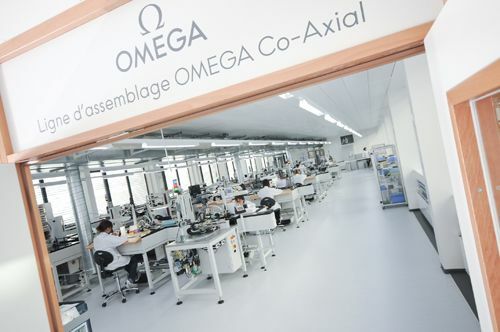 Unfortunately, we could not take pictures during the factory tour, but let us assure you that OMEGA does everything it takes to make sure the movements meet all requirements by both COSC, OMEGA and you, the critical customer. The new caliber 9300 chronograph movement is chronometer certified (which means it is very accurate – between -6/+4 seconds deviation per day – and will be for at least 5 years) and will not disappoint you in terms of look & feel. Look & feel? Yes, we think it is important how a chronograph ‘feels’ when operating the start, stop and reset buttons. We’ve had multiple comments on our test watch from (watch)friends who noticed that the start/stop mechanism feels like silk. With ‘look’ we mean the esthetics of the movement, which is in this case, sheer beauty. Because we also witnessed the production process of the new range of in-house movements, we’ve seen that a lot of effort and time is being put in finishing all the various parts of the movement. Both those you can see through the transparent case back but also those that can’t be observed by the wearer of the watch. Talking about the transparent case back, this is – in our opinion – one of the coolest extras on this Speedy. It seems that the sapphire crystal they used for the case back is almost identical to the one on the front of the watch (which isn’t the case of course). This results in a very domed crystal on the case back, which you will definitely notice when wearing it on your wrist. The transparent case back catches sun light in certain angles, which gives it a very interesting look. The photo below should demonstrate this. When you flip the watch, you”ll get a great view on the caliber 9300 movement. Partly, because the movement is covered by a main plate that covers most of the gears and gear trains. However, because the case back is entirely made out of sapphire, the view is still impressive. The finish of the movement and rotor clearly makes up for this. Also, the silicon parts are also noticeable through the sapphire crystal. Although the watch is significantly larger than the Speedmasters we are used to be wearing, it is one hell of a comfortable watch as a daily wearer. Despite the diameter of 44.25mm it wears comfortably on the wrist and it actually tooks us only a few minutes before we were used to it (instead of wearing 39/40mm diameter watches). Because we have and have had our share of Speedmaster Professional watches, we certainly appreciate the fact that OMEGA kept using the design of the case that mr. Claude Baillod came up with in 1957. The position of the pushers, crown guards and crown does remind us of the design of the Speedmaster Automatic ‘Reduced’, where the crown is somewhat smaller (because automatic instead of handwound) and is located deeper between the crown guards. The large black dial is being magnified from certain angles due to the [super] domed sapphire crystal and makes it extremely readable in combination with the white baton hands. Also cool, the date aperture located on 6 o’clock shows a black date wheel and a silver colored date. Completely in line with the printing on the tachymeter. A bit hard to capture on a picture, the lume is great as well. The hour markers and hands stay bright for a long time only after being exposed to (sun) light for a few moments. Setting time and date is very easy, just pull out the crown in the 2nd position (2 clicks) and move the hour and minute hands and put the crown in the first position (1 click) to set the date. The date is being set by moving the hour hand independently from the minutes hand. This takes a bit longer than you are used to with a quick set date, but it’s manageble. It is a similar to setting the date on a Rolex GMT-Master II. If we have to mention something critical about this watch, perhaps this would be it: the lack of a quick-set date. However, it didn’t bother us until we had to change the date and we soon forgot about it again when the watch was back on the wrist. We’ve noticed that some people have difficulties with the price tag of this Speedmaster Co-Axial Chronograph. 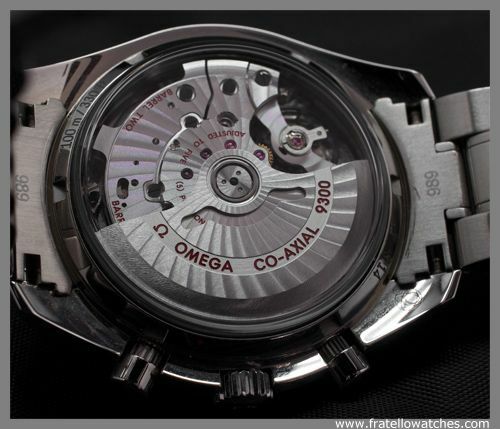 This OMEGA lists for 6.400 EUR (approx $8250.- USD). 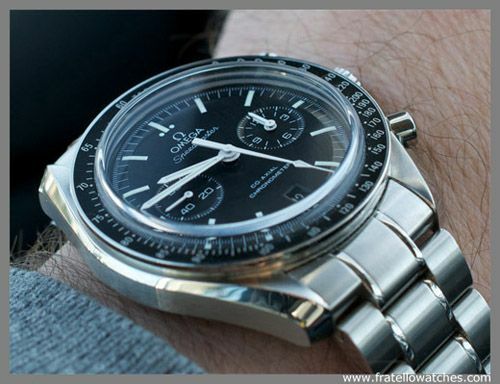 These kind of prices were – and perhaps are – quite unusual for OMEGA but comparing this Speedmaster Co-Axial to chronograph watches of other brands with similar features and built quality it is actually not that expensive. 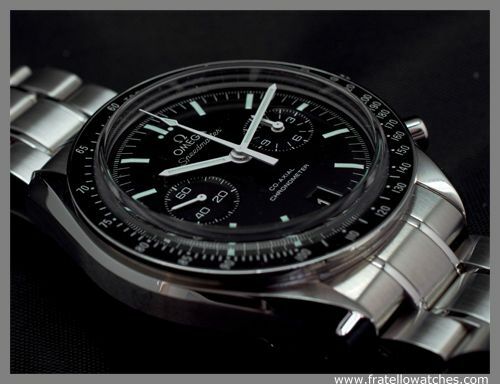 The Speedmaster Professional retails for much less, but again – this is not a Speedy Pro and definitely has some advantages over the hand wound ‘Moonwatch’.